Because it’s summer and because it’s always fun to talk about, I present to you the top ten defensemen in the NHL. I have used stats to compile this list, but it is subjective. I can no more remove my biases than I could my nose. For example, I am a fan of some players and maybe not of others. I see some players play more than others, and I the weight I give to certain statistics may be different from the weight you would give to them. I gave weight to mostly even-strength play, and tried to account for usage and team. One of the things I also tried to do was rank them based on how I think they’ll perform going forward. 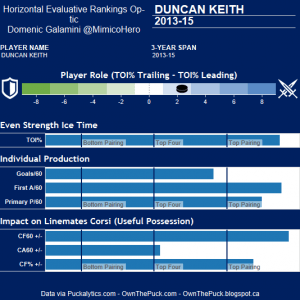 For example, I know people will say I ranked Keith too low, but every player ahead of him is much younger. I looked at data for the last three years. That is why you won’t see Aaron Ekblad on this list. Yet. With the legalese out of the way, let us begin. His 22 points last season were the tenth most in the NHL at 5v5. He played every game for one of the league’s best teams and was the fourth best possession defenseman in the NHL. 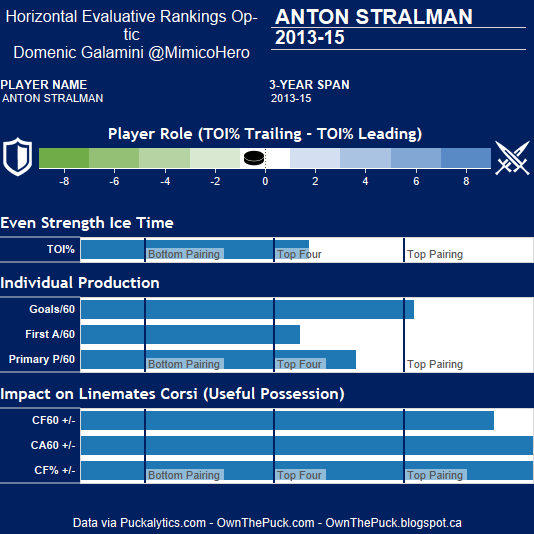 Criminally underrated, Stralman is 29 and set a career high in total-points with 39 last season. He led the Lightning in PK ice-time and PP points. 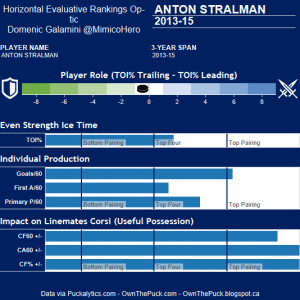 For the Last three years, he is the third best possession defenseman in hockey. As you can see from the chart, he scores goals at a first-line pace despite (over three years) barely getting second-line ice time. He also clearly makes everyone he skates with a better player. Leddy is also one of the most underrated players in the NHL. Last season, his first with the Islanders, he scored the eighth most 5v5 points in the NHL, with 24. Leddy also had the least ice-time of any players in the top 15. He is just 24 and only getting better. When on the ice last season, his team had possession of the puck for 55% of the time, good for 5th in the NHL. 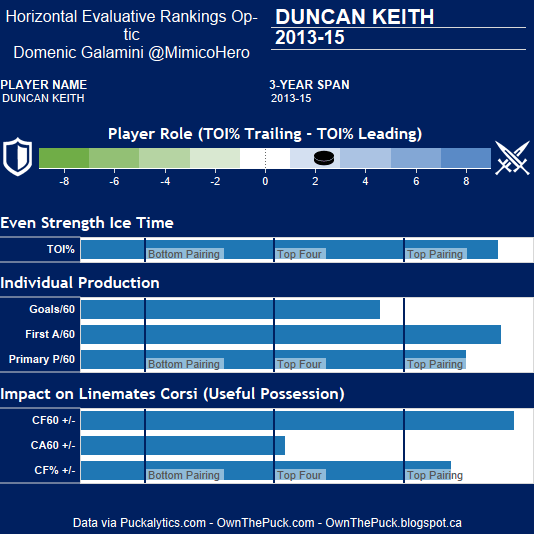 In two less minutes per game, and two less games overall, he put up virtually the same stats as Duncan Keith. 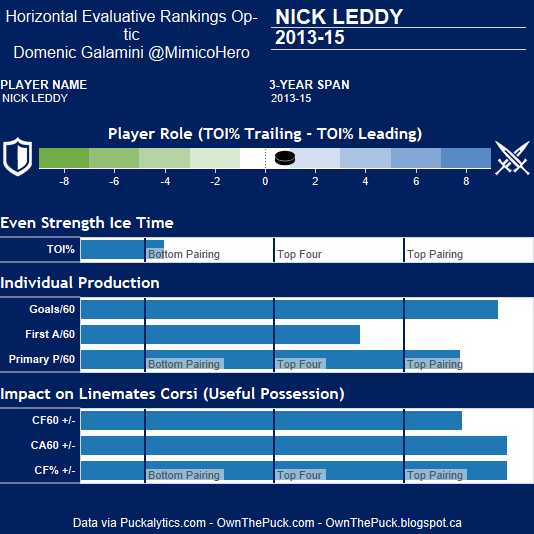 Leddy is comparable to Keith over the last three seasons, but he’s averaged four less minutes per game. 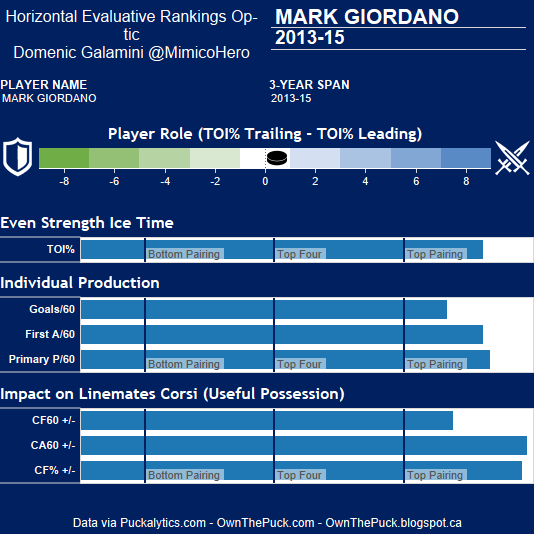 Over the last three seasons, he’s the 5th best possession Dman in the NHL. With Leddy, Boychuck, Hamonic and De Haan the Islanders have one of the best top-four D-groups in the league. 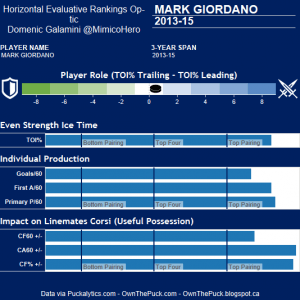 In the last two seasons, Giordano hasn’t played more than 65 games, and yet, he’s come close to 50 points in both of them. When healthy he is a terror, and it should be noted he is only this low because he’s missed 25% of the games in the last two years, and is going to be 32 when the season starts this year. There is also the troubling fact that he’s been a negative possession player three out of the last four years. Still, he puts up points at an elite level, makes his teammates better, plays tough minutes and also eats a ton of them. As you can see from the chart, he’s unreal when healthy. If he could stay healthy, I’d have him ranked even higher. Keith won his third Stanley Cup and was the MVP of the Playoffs. Some people would rank him #1 and I am not trying to be an iconoclast by putting him at #7, but like I said before, this list is subjective and he is 32, and his game – from a statistical perspective – is in noticeable decline. However, a decline from his crazy 2009-10 season (43 5v5 points, 57% CF) only means he’s gone from the best to the 7th best defenseman in hockey. Keith is still outstanding by any measure (obviously). His stats last year were ridiculous and he is bound to keep it up for a few more seasons still. The far and away, no questions asked, un-debatably most underrated player in the NHL. Just 26, he is overshadowed by Drew Doughty, which is unfair because for the last three years, Doughty’s possession ratings drop when he’s not on the ice with Muzzin. Muzzin, in the last three seasons, has a CF% of 60.21% which, to put it in perspective, the second best player (Doughty), has a 57.23% , but the range of Corsi is, at it’s most extreme, only 40-60% and therefore to be 3% higher than the second best player is massive. Also, only 12 defensemen in the NHL have a 55% or higher for the last three years. Muzzin is 23rd in 5v5 scoring over the last three seasons, and actually has one more point than Doughty in one less game. Doughty gets more ice-time and tougher zone starts, so that’s why he’s ranked higher (spoiler alert!) 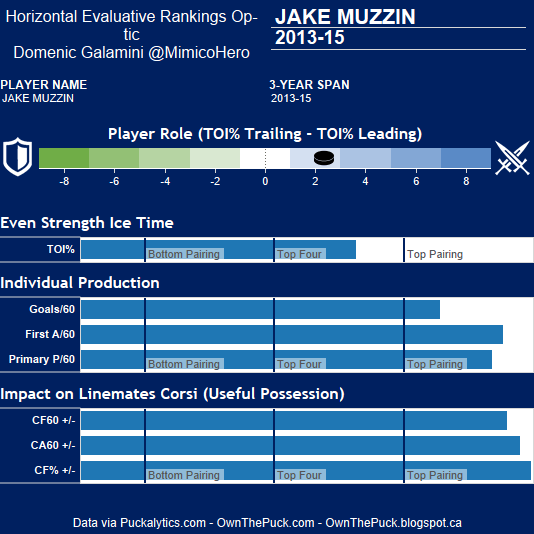 but Muzzin deserves to be called one of the best D in the game. He is essentially the Patrice Bergeron of defensemen. Part Two Is Now Available. Click Here.